The night has passed over the Tomb, wherein lies buried the Body of the Man-God. Death is triumphant in that silent cave, and holds captive Him that gives life to every creature: – but his triumph will soon be at an end. The Soldiers may watch, as best they will, over that Grave: they cannot hold Jesus prisoner, as soon as the moment fixed for his Resurrection comes. The holy Angels are there, profoundly adoring the lifeless Body of Him, whose Blood is to reconcile all things, both on earth, and in heaven (Coloss, i. 20). The Body, though, for a brief interval, separated from the Soul, is still united to the Person of the Son of God; so, likewise, the Soul, during its separation from the Body, has not, for an instant, lost its union with the Word. The Divinity remains also united with the Blood that lies sprinkled on Calvary, and which, at the moment of the Resurrection of the Man-God, is to enter once more into his sacred veins. Let us, also, return to the Sepulchre, and adore the Body of our Buried Jesus. Now, at last, we understand what sin has done: By sin, death entered into the world; and it passed upon all men (Rom, v. 12). Though Jesus knew no sin (II. Cor, v. 21), yet has he permitted Death to have dominion over him, in order that he might make it less bitter to us, and, by his Resurrection, restore unto us that eternal life, of which we had been deprived by sin. How gratefully we should appreciate this Death of our Jesus! By becoming Incarnate, he became a Servant (Philipp, ii. 7); his Death was a still deeper humiliation. The sight of this Tomb, wherein his Body lies lifeless and cold teaches us something far more important than the power of death: – it reveals to us the immense, the incomprehensible love of God for man. He knew that we were to gain by his humiliations; – the greater his humiliations, the greater our exaltation: this was his principle, and it led him to what seems like an excess! Let us, then, love this sacred Sepulchre, which is to give us Life. We have thanked him for having died for us upon the Cross; let us thank him, but most feelingly, for having humbled himself, for our sakes, even to the Tomb! And now, let us visit the Holy Mother, who has passed the night in Jerusalem, going over, in saddest memory, the scenes she has witnessed. Her Jesus has been a Victim to every possible insult and cruelty: he has been crucified: his precious Blood has flowed in torrents from those Five Wounds: he is dead, and now lies buried in yonder Tomb, as though he were but a mere man, yea the most abject of men. How many tears have fallen, during these long hours, from the eyes of the Daughter of David! and yet, her Son has not come back to her! Near her is Magdalene; heart-broken by yesterday’s events, she has no words to tell her grief, for Jesus is gone, and, as she thinks, forever. The other Women, less loved by Jesus than Magdalene, yet, still, dear to him, stand round the disconsolate Mother. They have braved every insult and danger in order to remain on Calvary till all was over, and they intend returning thither with Magdalene, as soon as the Sabbath is over, to honour the Tomb and the Body of Jesus. Thus speak the men! – the women are thinking of their morrow’s visit to the Sepulchre! The saintliness of Jesus, his goodness, his power, his Sufferings, his Death, – everything is remembered, except his Resurrection, which they had often heard him say should certainly and speedily take place. Mary alone lives in expectation of his triumph. In her was verified that expression of the Holy Ghost, where, speaking of the Valiant Woman, he says: Her lamp shall not be put out in the night (Prov, xxxi. 18). Her courage fails not, because she knows that the Sepulchre must yield up its Dead, and her Jesus will rise again to Life. St. Paul tells us that our religion is vain, unless we have faith in the mystery of our Saviour’s Resurrection; – where was this faith on the day after our Lord’s Death? In one heart only, – and that was Mary’s. 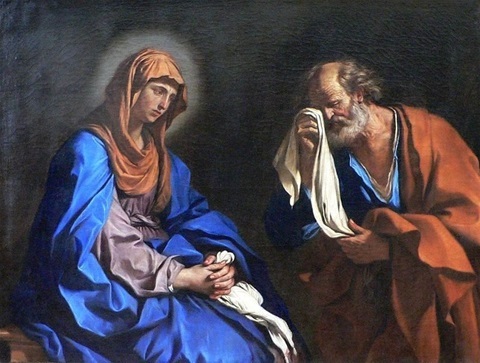 As it was her chaste womb, that had held within it Him, whom heaven and earth cannot contain, – so on this day, by her firm and unwavering faith, she resumes within her single self the whole Church. How sacred is this Saturday, which, notwithstanding all its sadness, is such a day of glory to the Mother of Jesus! It is on this account that the Church has consecrated to Mary the Saturday of every week. Click here to read, Part II - The descent into Limbo. Mother most Desolate, preserve our Faith!